Welcome back to the ongoing WarmaShock project! Okay I just thought of that on the fly, but it's kind of catchy, so I think I might stick with it! Elizabeth Comstock; BioShock Infinite's female lead. Back when this project was just going to be a small collection of BioShock-looking miniatures, Elizabeth was the first model I set my sights on, but once it became an army list I knew that with Booker DeWitt leading the force, Elizabeth had to be included. The entire story of BioShock Infinite follows Booker's attempt to rescue her from the city of Columbia - initially as a job, and eventually out of loyalty to her. 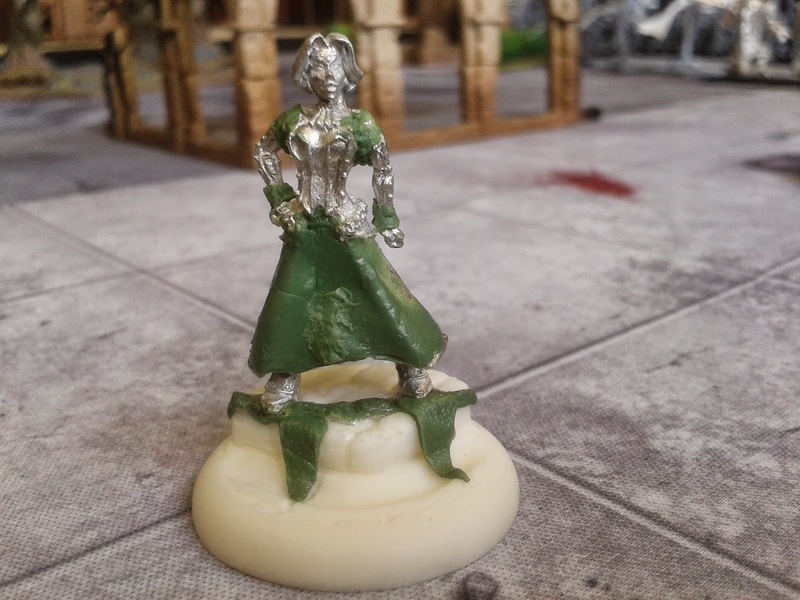 A lot of Infinite's players became very invested in the Booker/Elizabeth relationship as the game progressed - myself amongst them - and so I wanted to try my damned hardest to bring justice to the character with her miniature. All the more so since the Booker model turned out quite tidily! 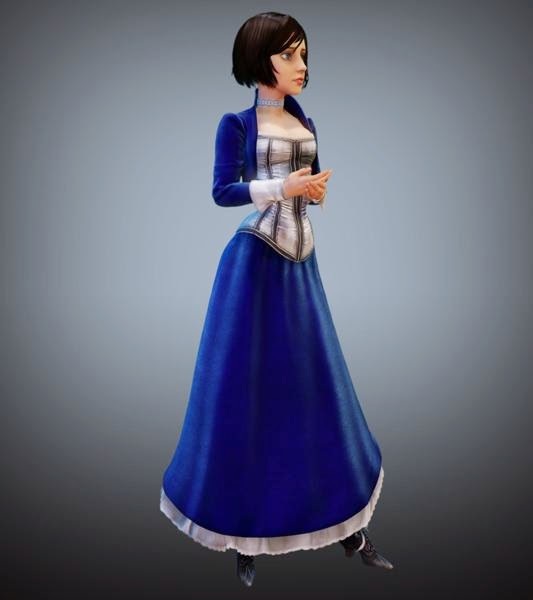 Elizabeth does wear a number of different outfits throughout the main game and the Burial At Sea expansion, but I've always been a fan of the white corset and blue jacket/skirt look in the image above, so this was the outfit I wanted my Elizabeth to wear. As per usual, the first order of business was to decide which model was going to be used as her base. Unusually for this project, however, I was able to use an actual Warmachine miniature instead of having to plunder the dark world of Malifaux! 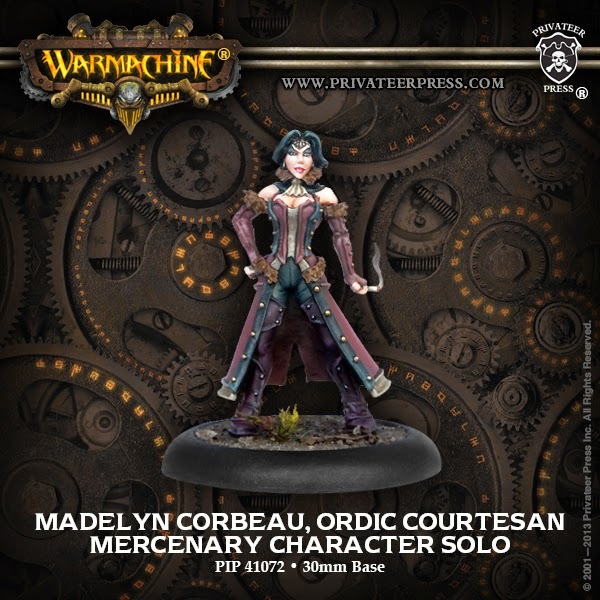 Madelyn Corbeau, Ordic Courtesan, seemed the perfect starting model for Elizabeth Comstock. A few alterations to the model would be needed, but the corset was there, the long coat, and the hair was almost perfect. My initial plan was to just leave the model as it was and just paint it up to look like Elizabeth, but ambition soon got the better of me and I decided to do everything in my power to turn Ms Corbeau into Ms Comstock! The first thing I did was to start trimming and filing back the parts of the model I didn't need. The cigarette in Madelyn's left hand was clipped off and filed back down - before any Burial At Sea fans pipe up, yes I know Elizabeth smoked in the expansion. However, in the main game she didn't, and it's the main game from which I've taken the outfit, so I feel justified in this. As the image of Elizabeth shows, she wears a short jacket, not long gloves, so I filed down the tops of Madelyn's gloves to make them easier to blend into the jacket when it came to sculpting time. I also clipped and filed back the ruff around her neck, as again this wasn't part of Elizabeth's outfit. This just left the jewelry on her forehead, which was a little tricky. I couldn't get it entirely flat without damaging her hair, so I did my best to scrape it off with a sharp craft knife to give her a bare forehead. I'd been lucky enough to get a cobblestone 30mm resin base for participating in a local Warmachine steamroller event a week previous, so with this acting as as the streets of Columbia it was time to crack open the green stuff and get sculpting! To start with I needed to make Madelyn's coat into Elizabeth's skirt, so I rolled a nice thin piece of green stuff and blended it across the front of the coat, and along the slit at the back, making the skirt one complete piece all around. That was the easy part! The next part took a few attempts seeing as I'm still learning to use green stuff properly. I needed to sculpt a short jacket on her upper body, covering her shoulders and blending into her gloves, and then coming to a stop around half way down her back. As I said, this took a few attempts, but after a week the model had a jacket I could finally be proud of! Or at least most of a jacket, for it was still missing one element: the cuffs. Seeing as Madelyn is wearing long gloves, they blend seamlessly into the hands of the model. With Elizabeth I needed the hands to be bare, which meant adding the cuffs to the miniature to separate the hands from the forearms. This proved to be much simpler than the rest of the jacket, and I was happy with the result after my first attempt. I've also been trying to do something a little more interesting with the bases. With Booker I added a few drops of blood, which seemed fitting seeing as he spends the game rampaging across the city! For Elizabeth I wanted to do something different. I didn't want to throw blood all over the base, but I wanted to add something to make it look more like the city of Columbia. That's when it struck me: flags! Columbia is a very all-American city, and you can't turn anywhere in the game without seeing red, white and blue flags, banners or bunting. So I decided to drape a bit of bunting across the base, as if it had fallen down onto the streets during all of the fighting. This was just a simple matter of creating some green stuff triangles and then tucking them neatly in against the kerb stones. So that brings my running total up to three! I'm currently planning to use Elizabeth as Madelyn Corbeau for obvious reasons, but I may experiment using her as Alexia Ciannor. This may sound odd, but bringing back Risen each turn could be a nice way to represent the way Elizabeth opens up tears to bring support through from other worlds to help out Booker. It might work, it might not, but I'm keen to give it a try! I think Elizabeth will be the last solo for a while. I want to get Andrew Ryan and the splicers on the go soon, and I have a pile of Big Daddies waiting to be built! So thanks again for reading, and keep checking back for the next addition to the army!